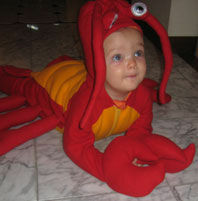 Looking for last-minute costume ideas for your baby's first Halloween? Check out your local Babies R' Us, or try online at One Step Ahead. Baby Style currently has a 50% off sale running in their costume boo-tique. Or, if you're feeling crafty, pull out a pair of footie pajamas, grab some felt and pipe cleaners, and get creative. Got an costume idea to share? Tell us about it in the comments section below. Here's a great idea from LilSugar: turn an old bridesmaid dress into a cinderella dress for your little princess. If you do decide to let your little one indulge in some first trick-or-treat sweets, be sure to check out our handy guide to taking care of your baby's teeth. And if you're pregnant, this is one night when you don't have to feel guilty about indulging in a little "Vitamin C." Afterall, chocolate is scientifically proven to make the sweetest babies. Dana Rousmaniere is FitPregnancy.com's Managing Editor. When she was pregnant with Charlie, her huge round belly doubled as a great jack-o-lantern.